1. Cook 300g essential Waitrose long grain rice according to packet instructions. 2. Meanwhile, chop 1 onion, trim and halve 110g essential Waitrose green beans and cut 1 essential Waitrose cauliflower into florets. Heat 1 tbsp olive oil in a large pan with a tightly fitting lid over a high heat, and sauté the vegetables for 3–4 minutes. 3. Stir in 2 tbsp Cooks' Ingredients korma curry paste and 150ml water. Cover and cook for another 8 minutes. 4. 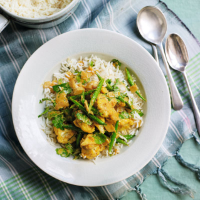 Take the curry off the heat, season and stir in 1 tbsp chopped coriander, 1 tbsp flaked almonds and 2 tbsp essential Waitrose low fat natural yogurt. Serve with the rice.